So April is over and May is here already, can you believe it? This year is flying! I thought I'd share my favourite items of the month with you all today as April has been a great month of Fashion for me as Chloe's Way was born in early April! How time flies! 1, 2, 3. Pastel Coloured Jeans. I've cheated a bit on these three, but I couldn't not put all three of them in, I couldn't decide which pair was my favourite so I just had to go for all three. As you all well know by now, the pastel trend is by far my favourite of the season and these jeans (all £11 each from Primark!) are amazing, I've been wearing all three loads and I'm hoping to get even more colours very soon! I've mentioned this so often and by now you probably all know how often I wear this dress and what a staple piece it is in my wardrobe. It's just so versatile and I love it so much! I go on and on about this but it really is just one of those things that I can always wear when I'm stuck in the morning, it can be dressed up or down depending on what accessories I pair it with. These are pretty much all I wear on my feet right now considering the weather here in the UK has been absolutely terrible! These go with almost everything, they can make a dress look more casual for a day at work or college, they look great with shorts and tights and add an edge to pretty skirts and pastel jeans. These are another staple item for me. I absolutely adore this, it is definitely one of my most treasured pieces of jewellery. I actually got it around this time last year on a trip to New York and I've been wearing it so much this month. It's so delicate and pretty and because it's pearls, it goes with everything! I wear this almost every time I wear silver jewellery. This is such a statement piece, without being too loud or scary. I love the pastel and mint green trends at the moment, so this was the perfect mix of pretty and edgy for me. This looks great with a more simple outfit as it's a subtle, yet statement piece. It also looks great layered with other bracelets! I love friendship bracelets and this kind of reminded me of one. I really love the sparkly beads on this one, and it's great how its three different colours so it can tie in with lots of different outfits. I loved this one so much that I gave one away on my first post on Chloe's Way. On that note, expect more giveaways soon! As you probably know from one of my latest posts, (if not you can view it here) I was sent some items from Ji Ji Kiki, which is an adorable online boutique that sells mostly jewellery as well as other things, but you can read about it in more detail in my post! i love everything, the jeans are so pretty, and I adore that mint spike bracelet! I have looked online for it or something similar but can't find it! 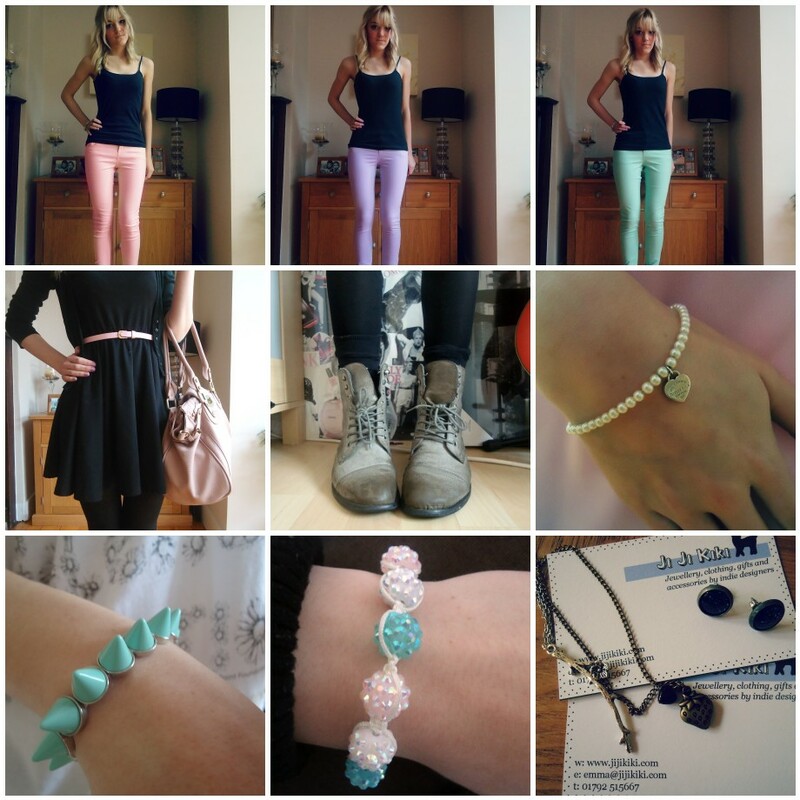 I love all your pastel jeans, will definitely be going to Primark and picking up a few pairs!